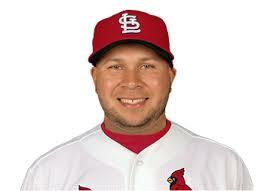 Arriving three days ahead of schedule, new Cardinals shortstop Jhonny Peralta is looking to make an impression. Not just for his new team and teammates. I’d venture to say this is also for the loyal fan base the St. Louis Cardinals have in you, fair reader! The Cardinals don’t have a saint in Peralta. And our fellow fans take great issue with that. Face it. We do have high expectations for our players. “The Cardinal Way” became nauseating to hear by a month into last season, but it is how we as fans expect things. And having a guy on our team who had a 50-game suspension for using performance enhancing drugs really messes with our world. “Getting in early here is important because I want to know everyone in the clubhouse before things start. Meet every coach, every training guy,” said Peralta. The former Detroit Tigers star also wanted to hear any questions his new teammates might have about him or the 50-game suspension meted out to him last year for a performance enhancement drug violation. “For that thing, too, I came here early to talk to everybody and let them know what kind of person I am,” said the 31-year-old Peralta, who returned to hit .333 for the Tigers in the playoffs. What? You were thinking it, too. I like that Peralta isn’t arriving to camp right on time and ignoring questions from the media. We’ve had players on the Cardinals that we’ve idolized and they never answered media questions. It’s refreshing to see this player, who could be a complete jerk about the whole situation, stand up and face everything head on. Not be a coward that gets special treatment. Team is more important than the individual. He wears the Birds on the Bat… I’ll give him a chance. And, unless Pete Kozma sounds more appealing, you should too! This entry was posted in 2014 Cardinals and tagged Jhonny Peralta, Pete Kozma by Miranda. Bookmark the permalink. He served his punishment, time to forgive and move on. It is impressive that he’s there early.